Anil Ambani-led Reliance Communications (RCom), which on Friday said it would be filing for bankruptcy in the National Company Law Tribunal (NCLT) after the telco failed to take necessary approvals from lenders and the Department of Telecommunications (DoT) to conclude its deal with Reliance Jio, informed the exchanges on Sunday that it plans to propose a similar debt resolution plan in the tribunal as was being earlier pursued with creditors. The company said the key elements of the plan would remain unchanged. This includes the sale of spectrum and all strategic telecom infrastructure assets, sale of realty assets apart from development of the Navi Mumbai real estate projects, which spans across 30 mn square feet at the Dhirubhai Ambani Knowledge City complex. RCom has debt of around Rs 47,000 crore and has invoked debt restructuring in June 2017. Sources privy to the development told PTI that the company was opting for debt resolution process to overcome the challenge of getting 100 per cent lenders or creditors approval required for taking a decision around asset sale, which has been hampering the process asset monetisation. “The company has been faced with mostly untenable issues raised by the DoT. These issues, inter alia, resulted in numerous legal issues at high courts, TDSAT and the Supreme Court, which frustrated the existing plan and can now be addressed or resolved under the NCLT process,” RCom said. Further, challenges raised by unreasonable minority lenders can now be overcome through the NCLT’s 66 per cent majority rule, against the 100 per cent approvals rule outside the NCLT, it added. According to the company statement also expects 'substantial unsustainable debt and liabilities' to stand extinguished under the NCLT process. In August 2018, RCom completed the sale of its fiber and related infrastructure assets, worth Rs 3,000 crore, to Reliance Jio in a transaction covering fiber assets of over 178,000 km across the country. In the same month, RCom reinstated bank guarantees worth Rs 774 crore with the DoT ahead of the timeline set by TDSAT and asserted that its Rs 25,000 crore asset sale plans are "on track". Taking the NCLT route, however, raises questions about the future of RCom's deal with Jio, as once the bankruptcy proceedings start, experts feel that there might be cloud over the deal as it is likely to be annulled. In December 2018, the apex court had asked RCom to furnish a corporate guarantee of Rs 1,400 crore within two days, following which DoT had to give it an NOC for the RCom-Jio spectrum sale deal within seven days. 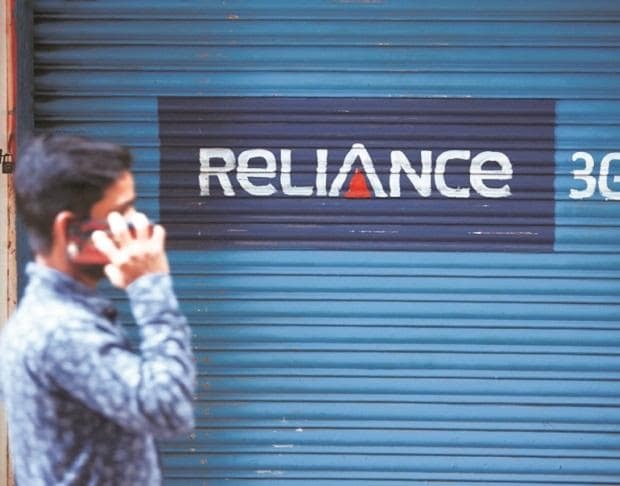 However, DoT reversed its stand following Jio's letter, where it sought assurances from the government that it won't be held liable for RCom's past dues related to airwaves. Now, Jio has extended the terms of their asset sale agreement by another six months.